3 1/8" U.S.A.F. F-86 Sabre Radio Magnetic Compass Indicator. Manufactured by Pioneer. Type 36137-1W-19A4. Very clean and also very heavy item. It shows very well and it would make an excellent show piece for the bookshelf in the office or home or just as a mock up panel instrument. Sold as is, no returns. 3 1/8" U.S.A.F. 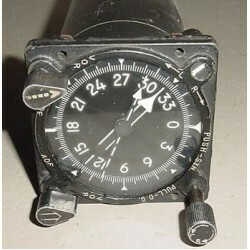 F-86 Sabre Radio Magnetic Compass Indicator. Manufactured by Pioneer. Type 36137-1W-19A4. Very clean and also very heavy item. It shows very well and it would make an excellent show piece for the bookshelf in the office or home or just as a mock up panel instrumen.. NEW! !, (nos), F-86 Sabre Jet Warbird Diluter Demand Oxygen Regulator. Type A-14. It has indefinite shelf life as indicated on attached tag. Sold as is, no returns. 3 1/8" RCAF /Royal Canadian Air Force F-86 Sabre Radio Magnetic Compass. P/N ID-918/ARN-6. It is in EXCELLENT condition. It would make a great show item of the office or home or as a mock up panel instrument. 3 1/8" RCAF /Royal Canadian Air Force F-86 Sabre Radio Magnetic Compass. Manufactured by Bendix. Model MN96B. Very clean item. It would make an excellent show item of the office or home or as a mock up panel instrument. 2" U.S.A.F. 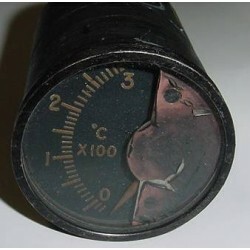 F-86 Sabre Jet Warbird Jet Exhaust Temperature Indicator. Manufactured by Lewis Engineering. Type H-1. P/N 147B9A. Very clean item. It shows well and it would make an excellent desk top or bookcase show item for the office or home. Vintage 3 1/8" U.S.A.F. 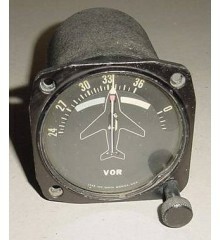 Warbird Jet Aircraft F-86 Sabre Radio Magnetic Compass / Course Indicator. Manufactured by Pioneer. Model ID-91B / ARN-6. It shows well and it would make an excellent desk top or bookcase show item for the office or home. It is a non working indicator. Sold for display only. Vintage 3 1/8" U.S.A.F. 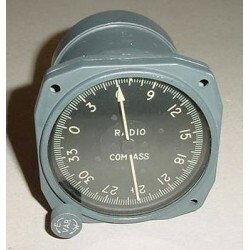 Warbird Jet Aircraft F-86 Sabre Radio Magnetic Compass / Course Indicator. Manufactured by Pioneer. Model ID-91B / ARN-6. It shows well and it would make an excellent desk top or bookcase show item for the office or home. It is a non working indicator. ..